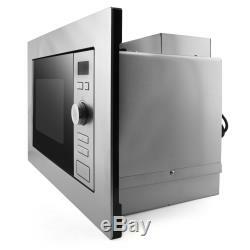 ElectriQ Built-in 17L Cupboard Fit Stainless Steel Microwave Oven. It's really easy to build into your kitchen, saving surface space. Its compact design means itll fit many cupboard space without any adjustments - just make sure you measure your space to perfection. The brushed metal finish looks fantastic and is unbranded for seamless integration. Eight cooking programmes help you to cook anything from pasta to popcorn perfectly. 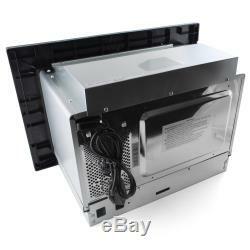 It has a super smooth stainless steel interior which makes cleaning quick and easy. If youre looking for a microwave that will fit seamlessly into your kitchen, without taking up any vital surface space, then this electriQ microwave is the one for you. It has a shallow depth, which makes it perfect for fitting into most kitchen units. Remember to measure your space accurately as this microwave will not fit every space! It takes away the guesswork that comes with cooking, something that puts me off! There are eight pre-set programmes which give you the ideal settings to suit your dish. Whether youre cooking pasta, fish, pizza or even popcorn, this microwave has got you covered. It has a maximum power of 700W too, which is really efficient and delivers excellent and even results. I found it really easy-to-use too. With a simple dial and button control, you can choose the perfect settings and begin cooking in next to no time. The white LED display is clear and gives you all the information you need as you choose your settings and prepare to cook your dish. Theres even a countdown clock as you cook, so youll know exactly when your dish is going to be ready and you can set the table in the nick of time! Its brushed metal finish is really easy to clean, and fits in with your other appliances. The fact that it is unbranded means itll seamlessly blend into your kitchen. This makes it suitable for any kitchen style, whether youve got a modern, minimalistic or classic country design. It's important to cover your food so that you don't make a mess, but if youre like me, youll often forget or don't quite cover it all. With this microwave, that doesnt matter. Its got a stainless steel interior which is really smooth, so any spills or splashes can be wiped away in a jiffy. Dimensions: H 388 x W 595 x D 300mm (+ 20mm faceplate). 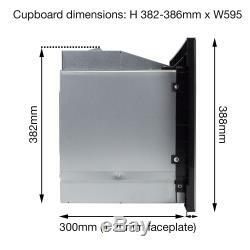 Cupboard/unit space dimensions: H 388 x W 595 x D 300 (+ 20mm faceplate). Seamlessly integrates into any kitchen. Shallow depth helps it to fit most cupboard spaces. 28 customers have bought and rated this product, giving it an average score of. If you'd like to pay by card, please have your e-bay user ID and item number ready and call 01484 448 969 with your card details. Nearly all orders arrive on time and in good condition but occasionally goods can get lost or damaged in transit, we do our best to prevent this by working the the highest quality couriers. The item "ElectriQ Built-in 17L Cupboard Fit Stainless Steel Microwave Oven" is in sale since Tuesday, June 14, 2016. This item is in the category "Home, Furniture & DIY\Appliances\Small Kitchen Appliances\Microwaves". The seller is "buyitdirectdiscounts" and is located in Huddersfield.